The Restaurant Series 48 inch cheesemelter by Bakers Pride provides evenly browned au gratin and Italian dishes. 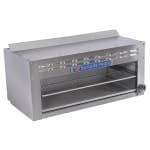 Stainless steel construction and chrome-plated wire rack ensure the long-lasting reliability of this cheesemelter. Its 48 inch width makes it a logical choice for busy kitchens.